Are you using lead scoring to better understand how likely your leads are to convert and when they should be sent over to sales? Implementing lead scoring as a part of your overall marketing strategy can help you better focus your marketing efforts while making you more efficient. If you’re considering using this awesome technique to get an edge over the competition, it’s first important to know your options. 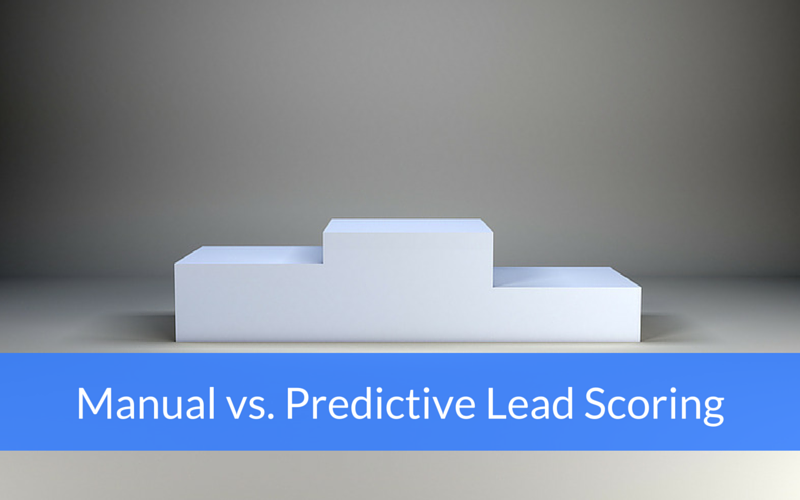 Here are the differences between manual and predictive lead scoring and what tools you can use to get started. Manual scoring is created by the user, meaning you assign a numerical value or grade to certain leads and lead activities (reading a blog post might be 5 points, downloading an eBook may be 15, etc.). This type of scoring is driven by your own research, using demographic data and behavior information you’ve collected. Therefore, if you’ve noticed that leads who completed a free trial in the past have converted in higher numbers, you might assign an A grade to them and a B to those who haven’t. Manual scoring also allows you to include as many attributes as you want to add (meaning you might be including some that really shouldn’t be factored in) and incorporates the weights that matter to you. Predictive scoring, on the other hand, is hosted by a third party, which also means you have access to all of the valuable data that the third party owns. This type of scoring is driven by your past customer data, integrates your demographic data and behavior information, and uses weights calculated by the model itself. This type of scoring system also oftentimes includes spam detection features and uses more in-depth contact attributes to better target certain leads. It can process your contacts and automatically compare attributes from both engaged and unengaged leads to build a model that rates contacts based on their likeliness to convert. These models will also tell you how they’ve rated your contacts, demonstrating the attributes that contributed to a certain score and giving you feedback so you can better focus your marketing efforts. If you’re ready to try out predictive lead scoring, here are some tools you can take for a spin today. HubSpot recently released its predictive scoring model, free with HubSpot Enterprise. If you’re not currently an Enterprise customer, you can try it out with a free trial. To use this feature, you’ll want to have been storing both engaged and unengaged contacts in HubSpot, been marking contacts as customers for at least three moths, have at least 500 contacts marked as customers, and twice as many contacts marked as non-customers. SalesPredict offers a lead scoring tool as a part of their predictive marketing platform. They incorporate your internal data and your leads’ activities on your website along with other activities they conduct around the web in order to present you with a more in-depth and overarching look into their online behavior. You can request a free demo of their platform here. Are you using manual or predictive scoring in your marketing strategy? What are the pros and cons of each? What tools are you using? Let us know in the comments!